One of the most important features of Estierra is the ability to do high speed animations and manipulations of the terrains. 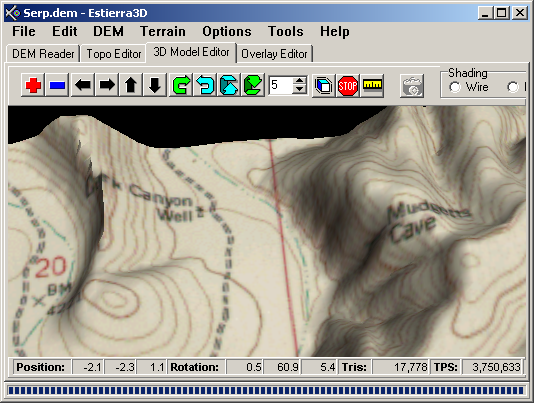 This means that with simple mouse movements you can view the terrain from any angle and zoom in or out at will. The program can display the images of the terrain at frame rates up to 100 or even 200 frames per second. This makes it possible to fly over the terrain using a joy stick as though you were watch it out an airplane window. Animation Examples. The following photographs show an animation in actions. You will notice the Frame Rate display just above the terrain on the rate. As you can see, the frame rate is 48. 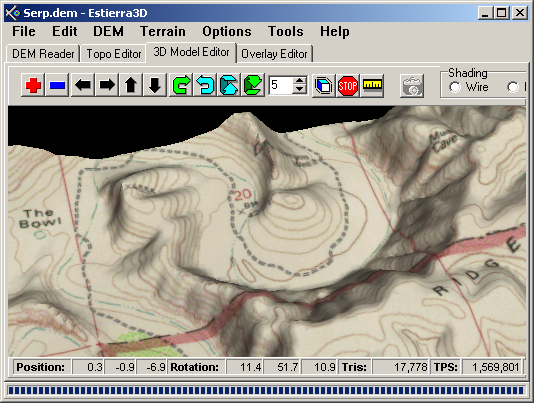 This means that Estierra is displaying the terrain at a rate of 48 frames per second. This is much faster than is necessary to produce smooth, realtime animations. Here we have flown further toward the back of the terrain with a joy stick. If you have a joy stick, it operates just like an airplane allowing to bank and turn left or right and pitch forward and back. Similar movements can be accomplished with the mouse. If you want more controlled movements you can use the buttons on the tool bar to manipulate the terrain in small increments. Here we have flown further and turned to the right and pitched downward giving a better view of the river bend. You will notice that the frame rate has now increased to 50 frames per second. 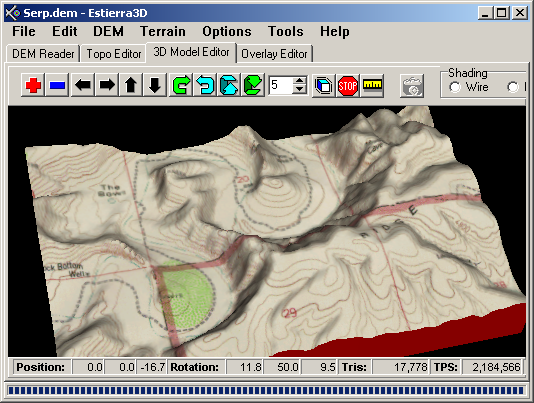 This often happens as fly closer to the terrain because the program does not have to display all of the terrain.